US Secretary of State John Kerry is trying to overcome the controversy surrounding the recognition of Israel as a Jewish state by changing the definition to “the national homeland of the Jews”, the London-based Arabic Al-Hayat newspaper reported Saturday morning. The report, that quoted western diplomatic sources, noted that in exchange for Kerry’s initiative, the Palestinians would have to agree that the Palestinian capital would be established only in parts of East Jerusalem; it was further reported that the Palestinians have rejected the proposal. Suddenly, it’s 1947. Or 1920. The nations still can’t decide if the Jewish people deserve a state, or something less than one. I’m sure I don’t understand the difference between a “Jewish state” and a “national homeland of the Jews,” and I’m not going to speculate. Israel is a state, and a lot of Jewish blood was spilled to make it so. This, actually, is what brought it into being, not the “international community,” the declaration of Lord Balfour or the decisions of various world powers, the League of Nations or the UN. Today, because of a combination of cowardice, avarice and Jew-hatred, the nations would like to take back any commitments they may have made to the Jews. But the Jewish state rests on its own accomplishments and struggles, not on their acquiescence. So let them try. Those who say that the Palestinians ought not to be required to recognize Israel as a Jewish state are correct. Who are we to take away the Cause that is their reason for being? On the other hand, who are they to say that we ought to give away parts of our homeland to our enemies? More, who are they to say that Israel should release murderers so that these same Palestinians will agree to continue talking, when so far all they have talked about is how we should give up everything we won with the aforesaid Jewish blood? There is a Jewish state because the Jews rose up and threw out the British, who had even then gone back on their commitment to nurture a Jewish homeland, and who condemned thousands, maybe tens or hundreds of thousands, of European Jews to death at the hands of the Nazis by their policies. After that, the Jews had to fight wars and terrorism waged by the Arab nations, whose ethnic and religious prejudice made a Jewish state in the Middle East unacceptable to them. But they will have to accept it, like it or not. And we don’t have to pretend that their motives are anything other than primitive prejudice. VFM: What do the Israelis want? Me: They want the Palestinians to stop trying to kill them. In return, they will give them some of their very small homeland for a new Arab state. But they can’t get the Palestinians to agree to take it. VFM: The Palestinians want a state, and the Israelis want to give it to them? But why won’t the Palestinians take it? Me: Because they won’t take it unless the Israelis agree that the part that they don’t give them belongs to the Palestinians too. VFM: That doesn’t sound fair. I suppose the Palestinians must be very powerful in order to demand so much. Me: No, actually Israel is much stronger militarily and economically. VFM: Then what’s the point in talking to them? I have been the editor of our local Jewish Federation newsletter for several years. Now that I am about to leave and go back to Israel, I wrote a “last editorial,” a letter to my (liberal) Jewish friends. I think it might be of broader interest, so I am reproducing it here. This will be the last Federation Focus that I will edit. Some of you know that after almost exactly 26 years, Lise and I are moving back to Israel. It’s a strange feeling – on the one hand I’ll be with two of my three children and 7 of 8 grandchildren; but on the other, Fresno will always be my home. This part of my life, in a place where I found a great deal of warmth and friendship from Jewish and non-Jewish people, is ending and a new one beginning. At times like these my thoughts turn beyond my personal concerns, to history and to our people. I was born in the US during WWII, which means that I grew up in one of the most remarkable places and times, an environment in which, among other things, a Jew didn’t have to worry about being murdered for being a Jew. It doesn’t sound like much, but it has been quite special in Diaspora history. By the time I was 20, barriers to Jews in various occupations, quotas at universities and real estate restrictions were virtually gone. A Jew in America could be an American and a Jew. The horror of the Holocaust stunned Americans like General Dwight D. Eisenhower, who saw death camps with his own eyes in 1945. This, they felt, was the natural outcome of Jew-hatred, and they vehemently rejected it. Since then, traditional Jew-hatred has been marginalized in America, along with all forms of racism and ethnic prejudice. It is simply not acceptable, at least in polite society. But something else took its place. Around 1968, Yasser Arafat took over the PLO, an organization dedicated to ending Jewish sovereignty in the Middle East. Until then, the PLO’s rhetoric was the usual “throw the Jews into the sea” variety, which – especially after the Holocaust – didn’t go over very well in the West. So Arafat sought out, and received, advice from the masters of propaganda at the Soviet KGB. And they told him to turn the story around: instead of a tiny Jewish state standing up against the might of a racist, genocidal Arab world, instead of Arabs trying to end Jewish sovereignty and self-determination, they told him to present the conflict as the struggle of a powerless, indigenous third-world people, the ‘Palestinians’, to be free of their colonial oppressors. Although this required a distortion of history – suddenly, Arabs from Syria or Egypt who had been in Palestine for one or two generations had to be presented as the remnants of a millennia-old ‘Palestinian’ civilization, and Jews who were hated and exterminated in Europe became ‘European colonialists’ – it fit in perfectly with the decolonization movements throughout the world, the civil rights movement in the US, the perception of the Vietnam war as a colonial war, and the New Left’s hatred of ‘American imperialism’. Later, the language of civil rights was invoked with the 1975 ‘Zionism is racism’ resolution in the UN, followed by the 2001 Durban Conference in which Israel was accused of being an ‘apartheid state’ and likened to South Africa before the overthrow of the apartheid regime. Ugly words, with absolutely no connection to the truth, but by this time a large group of people were ready to believe almost anything negative about Israel. And the Arabs and their supporters provided plenty of material, expertly exaggerating real events, making up things that didn’t happen, and even staging ’atrocities’ for the benefit of the media (the word ‘Pallywood’ was coined to describe these productions). Israeli efforts at getting the truth out were often late and inadequate. The degree of animus against Israel on the Left became so great that it disconnected not only from the facts, but from logic. Israel was demonized, and every accusation against her was believed – just as the medieval Jews were accused of poisoning wells and making matzah from Christian blood. A double standard was applied – Israel’s every action in self-defense was subjected to intense scrutiny while serious human rights violations committed by other countries were ignored. Finally, Israel was delegitimized – its enemies argued that its evil was so great that (unlike any other country in the world), it should not even exist. Instead of hating Jewish people (which is still taboo, at least in the US), they hate – no less irrationally – the Jewish state. This is often presented as simple political disagreement with Israeli policy, but the “three Ds” (as they were called by Natan Sharansky) – demonization, double standard and delegitimization – always give it away. This puts tremendous pressure on American Jews. Many Jewish immigrants found a place on the American Left, particularly in the labor movement (my grandfather was secretary of his chapter of the ILGWU). They strongly supported FDR and the Democratic Party. Their children and grandchildren were in the forefront of the anti-Vietnam War movement and the student revolts of the 1960s. They grew up, had children of their own, and sent them to ‘good’ colleges where ‘academic freedom’ has come to mean ‘political indoctrination’. They read the New York Times and listen to NPR. The election of Barack Obama has torn the relationship wide open. How could Jews not support the first black president, who many see as the final triumph of the civil rights movement that they supported so strongly? But at the same time, despite positive rhetoric, the administration’s actual policies toward Israel have been remarkably unsympathetic and even dangerous. Today, many Jewish Americans are ambivalent about Israel (or even openly hostile), believing – incorrectly – that Israel acts in ways that contradict their liberal or progressive ideals. Jews are even at the forefront of some of the most vicious anti-Israel organizations in the US. This subversion of American Jewish support for Israel has been one of the greatest accomplishments of the forces that want to deny the Jewish people their right to sovereignty in the one tiny Jewish state. The writer Peter Beinart made a career out of saying that Israel has forced American Jews to choose between their liberalism and Zionism. This is inaccurate. The truth is that a perversion of liberalism is making “new anti-Semites” out of them. Most of us don’t remember a time when there wasn’t a state of Israel – when a Jew had no homeland and was physically and psychologically dependent on his non-Jewish hosts. When a Jew didn’t belong, wherever he lived. History tells us that it will not always be so easy to live in the Diaspora. American society is changing rapidly, and the unique situation that has held since 1945 will not continue forever. It will not always be possible to be comfortable as both an American and a Jew, particularly a Zionist Jew. Did you know that the IRS already gives ‘special treatment’ to organizations that support Jewish communities in Judea and Samaria? The existence of a strong Jewish state is essential to the continued existence of the Jewish people, and the support of the US – or at least the indifference of the US – is essential to the state. Unfortunately, for various reasons US policy today is less pro-Israel than it has been at any time since 1948. As I say goodbye to my Jewish friends in the Central Valley, I ask you to open your eyes. Don’t let yourselves become unwitting agents of a new incarnation of the old hatred that we have faced for thousands of years, just because it falsely presents itself as ‘progressive’. If we, American Jews, don’t fight for our country to support Israel, who will? According to genealogical research of the Bedouin families in Israel, the Erekat family belongs to the extensive Huweitat clan, which originated in the area between the Liya valley, near Taif, in the vicinity of Mecca in the northern Hejaz region, close to the town of Hekl in the Sarawat Mountains, 350 km. from the Jordanian border, and northern Aqaba. Bedouin genealogical literature claims that the Huweitat clan is a Sharifi clan allied with their cousins the Hashemites. The Huweitat clan settled not only in Israel but also in Jordan, Saudi Arabia, and the Sinai Peninsula by Ras Seeder. A branch of this clan settled in geographic Palestine in several waves of immigration that started some 200 years ago, ending during the period of the Arab Revolt and First World War. 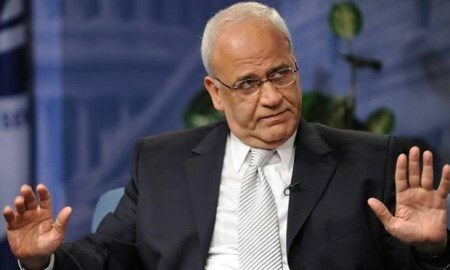 Apparently, the family to which Erekat belongs settled in Abu Dis near Jerusalem during the last of these waves, which occurred in the early twentieth century, after the Jewish immigration to the area. The Palestinians are not the farmers who have lived in Palestine for generations, but rather immigrants who only arrived recently. It was only toward the latter stages of the nineteenth century that the country began to blossom thanks to the emergence of a new presence – Zionism – and the amazing results. In 1878, the population of the country numbered 141,000 Muslims who lived here permanently, with at least 25 percent of them considered to be newly arrived immigrants who came mostly from Egypt. Various studies done over a span of years by Moshe Brawer, Gideon Kressel, and other scholars clearly show that most Arab families who settled in the villages along the coastal plain and the area that would later become the State of Israel originated from Sudan, Libya, Egypt, and Jordan….Other studies show that the waves of immigrants came here in droves from Arab countries during the period of the British Mandate. Why do I bother (and why did Baker, whose well-documented paper should be read in full)? Not, I think, because being indigenous is of such overriding importance in determining ‘who owns the land’. After all, ‘indigenous’ is a highly relative concept. Yes, the Jews are more indigenous to Judea than the ‘Palestinians’, but probably the descendents of the ancient Philistines (also, incidentally, not the contemporary ‘Palestinians’) have more roots than the Jews in what is today Tel Aviv. Peoples migrate, assimilate, conquer and get conquered, wax and die out. Legitimacy comes from a combination of factors, of which one is prior possession, but it is not the only one. Modern international law (the UN charter) does not recognize taking land by force; rather, it prefers diplomatic consensus, which is why the Jewish people argue that they legitimately obtained title to the entire land of Israel with the San Remo conference of 1920, and legitimately defended it in 1967. Of course, the reason that the international community chose Palestine for the Jewish homeland was the Jewish people’s historical provenance there. The Arabs, by inventing their own historical narrative and denying the Jewish one, wish to lay the groundwork to overthrow the just decision that was made by the international community in 1920, before its institutions became corrupted by Arab oil and terrorism as well as postmodern Jew-hatred. Happily, it is also true that possession is nine-tenths of the law, and today’s Israel is capable of defending itself, as long as it can stay unified — despite some of its intellectuals who appear to have accepted the narrative of their own deadly enemies. No, I do not have an opinion on whether or not the well-known biblical promise will be fulfilled. But there is a sense in which betrayals — of allies and ideals — do indeed bring down a curse on a nation. The US is a liberal democratic country, one in which belief in the rights of freedom of speech and religious expression are almost fetishistic. You would expect that it would support other nations with similar ideals, and that its policies would favor freedom and tolerance, and oppose oppressive regimes. But lately it has been doing the opposite. George W. Bush was explicit in his belief that promoting democracy around the world was one of the most important goals of his policy. Perhaps the implementation was naive, but who can disagree with the intention? Apparently the present administration has decided that Islamism is the wave of the future, despite being fundamentally anti-democratic, racist and misogynistic, and denying just about all the basic freedoms that are so important to us. Regardless, Obama’s America has decided to back the strong horse, support the Muslim Brotherhood, and not push too hard against Iran. This is cynical and, worse, a betrayal of the principles that our nation is founded on. Now maybe you think the US is really playing with a deck stacked against the poor and ‘people of color’, etc., and those principles are just a lot of propaganda to keep the chumps in line. Even if you are right, though, aren’t these the ideals that we, as a nation, should be trying to realize? Even if it is true that the US committed genocide against the indigenous inhabitants, even if it is true that the institution of slavery existed here for hundreds of years, does this falsify the ideal of equal justice and opportunity for all humans that we should be striving to achieve today? Of course not. Our exceptionalism consists in the belief that we Americans have a commitment to live according to the principles of “liberty and justice for all,” as it says in the Pledge of Allegiance, and a duty to champion these values in the world — because we believe they are right. We believe they are objectively better than the values of the Muslim Brotherhood or the Iranian regime because they reject the idea that some humans (male Muslims) ought to have more rights than others, because they understand that slavery is wrong, women are not chattel, executions for apostasy and homosexuality are repugnant, and that planning and preparing for religious genocide is not acceptable. Exceptionalism is not simply chauvinism, as the President’s comment suggests; it has a moral basis. Can you honestly say that the Brotherhood and the Iranian regime are not morally worse than we are, just different? I think you can’t. Our recent loss of power and prestige — as Israel’s Moshe Ya’alon recently pointed out to the enormous discomfort of the administration — is due directly to the lack of confidence in American ideals in those at the very top of our political pyramid. Vladimir Putin’s opponents may not admire him, but they respect him because of his consistency in pursuit of his goals. Our administration behaves inconsistently because it doesn’t know what its goals are, so naturally we get no respect. 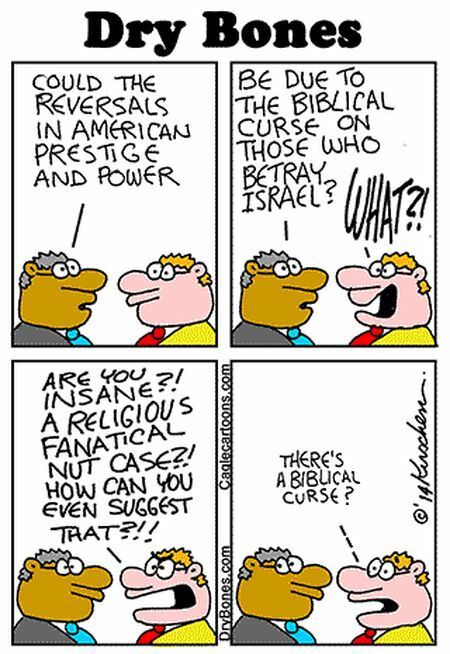 If there is a political sense to the biblical curse, this is it. Yes, the US is betraying Israel, its true ally and the only country in the region that shares its values. It is also betraying these values, and is beginning to pay a high price for it. This kind of talk could only take place in darkness; in beer cellars, at violent fringe demonstrations or at the headquarters of outlawed organizations. Only the extreme, fascist, neo-Nazi, anti-Semitic and xenophobic right would dare to breathe a word of it. Only skinheads and their masters would dare to speak of national purity and of defining their country based on ethnicity, religion, race, nationality or heredity. It’s “no entry” to Middle Eastern culture, to Arab art and history, to African asylum seekers, to anyone who isn’t a Jew. Every Israeli knows the mantra “a Jewish state,” but it’s doubtful anyone knows what it means. Is it a halakha state run in accordance with Jewish law? Is it a theocracy with no civil marriages, no public transportation on the Sabbath and a mezuzah on nearly every doorpost? That’s a Jewish state. And would Israel be non-Jewish without these traditions? Would it be non-Jewish with 50,000 asylum seekers and Jewish without them? We haven’t yet decided whether Judaism is a religion or a nationality, or even who is a Jew. The main thing is that we want a Jewish state, the kind Palestinian President Mahmoud Abbas will recognize forever. Some of my correspondents think I shouldn’t waste time on such as Levy. But he raises some issues that are highly relevant to today’s diplomacy in a clear way (and he’s just as clearly wrong about them). He asserts, first, that nationalism must be fascism. This is a poor argument which depends on a conflation between civil rights and national expression. Full civil rights for minorities — voting and representation, all state economic benefits, the same degree of freedom of speech, religion, assembly, etc. as the majority, are generally recognized as something a national government is required to provide. National expression — a flag, a national anthem, even a dedication to the preservation of a particular group and its culture, is not necessary for life and is not automatically due to everyone in a diverse society. The Nazis, of course, systematically deprived Jews and other ‘undesirable’ groups of their civil rights, including the right to life. Israel, on the other hand, is committed to providing full civil rights to all of its citizens, while it defines itself as the state of the Jewish people. The difference is immense. Not only is a Zionist state morally acceptable, it is necessary: in the case of some ethnic groups, particularly the Jews, the world’s nations have historically denied their civil rights. One of the driving forces of Zionism has been the unhappy fact that Jewish rights cannot be guaranteed except in the framework of a Jewish state, one whose reason for being is in part to ensure that these rights will always be preserved. Norwegians are welcome to create non-nationalist states with open borders if they wish, but this would be a poor choice for Jews. The existence of a Jewish homeland also protects Jewish rights in other nations, by diplomatic action, rescue, or conceivably by military force. Could an ‘Israel’ — or whatever it would be called — “of all its citizens” perform this function? How long could such a state even keep its Jewish majority? Levy notes that it is not easy to define ‘Jew’, nor to determine the proper amount of influence to give to religious institutions and values. All this is true, but so what? Just because it’s hard to provide a simple definition of something does not imply that the concept isn’t meaningful. And even a decidedly pluralistic state like the US has trouble defining who are members of minority groups (something Americans obsess about) and finding an appropriate place for religion. “No one would dare say France for the French…” says Levy. He’s wrong. Marine Le Pen heads the third-largest party in France, and she talks exactly that way. In the halls of the Left she’s called a fascist, of course, but almost 18% of French voters preferred her in 2012, compared to Nicolas Sarkozy (27%) and François Hollande (29%). 6.4 million French citizens are not Nazis! Le Pen’s success is partly a reaction to the practical problems that result from almost uncontrolled immigration. Levy also seems to think that tiny Israel can be a solution for an unlimited number of refugees from dysfunctional African states, but even Europe can’t do that. Finally, Mahmoud Abbas also wants a nation-state, for the ‘Palestinian people’. It’s pretty clear that, like Jordan and Saudi Arabia, there would be no Jews in ‘Palestine’. The proposed constitution for Palestine states that “Islam is the official religion of Palestine.” I have never heard Levy or anyone else on the Left object to this, or compare the Palestinians to Nazis. Even the usual concerns for human rights (don’t forget women, gays, etc.) are elided where the Palestinians are concerned. The Left’s vision of a borderless world in which every nation is a “democratic state of all its citizens” is being tried now, in Europe, and it is failing badly, economically, socially, and — most important — demographically, with native fertility rates far below what’s needed for the society to survive. Israel’s Jewish fertility rate is a healthy 2.8, well above the replacement rate of 2.1. Perhaps Israel’s social and economic vitality has something to do with the national pride and religion that still exist there, despite what is written in Ha’aretz? Without Jewish nationalism, that is, Zionism, there would be no Israel, and no reason for one — which is why psychopathic Jew-hater Gideon Levy advocates against it.